The Last Train is a survival adventure game from Smash Game Studios. You take the role of one of the last surviving train pilot in a post world War 2 America. The game is set in Alternate History, post the Hiroshima and Nagasaki bombings. In this emotional journey, the story explores how war affects ordinary citizens who want to go about their day to day lives, not just the brave soldiers who fight on the front lines. As a train pilot you are tasked to go around the country to help as many people as you can. During the journey you will come across many survivors and you will be rewarded generously by the rich and get the moral satisfaction of helping the poor. Help the remaining survivors reach their families, help the terminally ill or make the most out of the dire situation by hoarding all the supplies you get from them. All the decisions that you take will shape the story and affect the world around you. Explore over 20 different cities in the United States. Meet over 150 unique characters with their own backstories and rewards. There are over 15 Cutscenes to immerse you into the gameworld. Choose from Story Mode or Sandbox Mode to play the game. If you get stuck in the game, check out the video walkthrough and gameplay for the game. 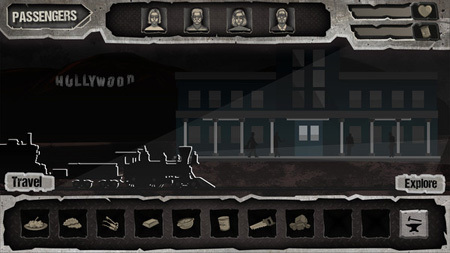 This entry was posted in PC Games, Walkthrough and tagged The Last Train Cheats, The Last Train Game, The Last Train Gameplay, The Last Train Guide, The Last Train Hints, The Last Train Review, The Last Train Solutions, The Last Train Strategy, The Last Train Tips, The Last Train Walkthrough by Marvin. Bookmark the permalink.